October is a very busy month for local equestrians. In addition to their own busy competition schedules, there is foxhunting and autumnal trail riding. Nevertheless, we make time for our annual pilgrimages to the Fair Hill International and the Washington International Horse Show. The Dansko Fair Hill Festival in the Country is held in northeastern Maryland near the Delaware state line, while the Washington International Horse Show is held a mere two hours south of Fair Hill in the District of Columbia (which, as we all know, used to be part of Maryland anyway). WIHS uses the Prince George’s Equestrian Center in Upper Marlboro as a satellite location. Sometimes we locals take these internationals for granted. We are a tough lot. When something is in one’s own back yard, one does have a tendency to take it for granted, and have elevated expectations. Those equestrians who travel from afar are generally just so delighted to be here that, no matter what happens, they enjoy the show. But not our readers! Our readers go year-in and year-out, have high standards coupled with gossamer coated childhood memories against which the current shows much compete. That is tough. When Washington was at the Cap Centre (later named the USAir Arena) in Landover, everyone complained that it was never as good as it was when it was at the D.C. Armory. Now that it is at the Verizon Center in D.C., everyone says it is not as good as it was when it was at the Cap Centre. It is tough to compete with memories. Fair Hill fares a bit better than Washington, being a younger show (only 21 years old as opposed to 51 years old), and has not had any relocations. In due time, FHI likewise will have to compete childhood memories. Complicating the matter for local equestrians is the reality that we are not the target audience for these shows. Because local equestrians are, and will remain, the core audiences (because we do return each year, no matter what), we tend to assume that we are – or should be – the primary target audience. But the brutal reality is that we are not the primary audience for either Washington or Fair Hill. The non-horse person is the primary audience. Why? Because there are more of them than us, and both Washington and Fair Hill need to generate high attendance figures. Why? Washington and Fair Hill are huge, expensive undertakings, requiring a combination of paid employees and passionate dedicated volunteers. Budgets run in the mid to high six figures, and both activities require hundreds of thousands of dollars in cash sponsorships – sponsors dropping that kind of coin expect spectators – and lots of them, more spectators than the equestrian community alone can provide. Because Fair Hill must deal with the vagaries of weather, but has the benefit of boundless land, organizers cleverly partnered with a dog agility trial, ensuring that – no matter what the weather – FHI has some sort of audience, which makes sponsors and vendors happy. Washington, on the other hand, must work hard to attract the city and suburban dwellers who are interested in being entertained by horses. While we horse people can sit mesmerized for hours watching round after round of top notch jumpers, or dressage or hunters, the average spectator’s eyes will glaze over. Throw in some trick riding, terrier races, barrels or military maneuvers and they perk right back up! While the non-horse person may appreciate the international caliber of horses, time has shown that they need more than just the jumper classes to make them feel it was worth the time and the money to attend the show. The organizers of WIHS struggle to get just the right blend of international caliber equestrian sport (the essence of the show) combined with equestrian entertainment. The recipe varies from year to year, depending upon the cooks in the kitchen, and some years it is a tastier, more satisfying concoction for horse people, and other years the recipe just leaves a bad taste in our mouths. Most of our readers do understand that Washington has to offer more than just the jumper classes, but because they are horse people, their expectations for quality equine entertainment are much higher than the non-horse persons threshold. Nonetheless, our readers are loyal, so they keep going back to the show. And they are vocal – very vocal. So, when they approve, they approve loudly, and when they don’t approve, they are even louder. For the most part, our readers are fair, although there is still a contingent of those who unrealistically wish the show would move back to the now non-existent Cap Centre (every year, we seem we have to remind our readers that it was imploded years ago). The Equiery’s annual review presents something of a progress report for organizers, reflecting the local audience’s perspective on the evolution of the Internationals. Over the years, organizers have listened to you, our readers, and have adapted to meet your expectations. We hope you will continue to share with us your thoughts and impressions of the Fair Hill International and the Washington International Horse Show. Really, that is essence of the 2009 Dansko Fair Hill Festival in the Country. It rained – and it affected everything, from the number of spectators to the success of the vendors to the competition itself. The Festival in the Country is a huge undertaking, as it comprises a CCI***, a CCI**, nationally ranked dog agility trials, the United States Pony Club’s President’s Cup Games, falconry and a classic cars rally. Including stabling and parking, it uses approximately a third of the Maryland Department of Natural Resources 5,613-acre facility. There are twelve sponsors and one beneficiary: Union Memorial Hospital. The four day event takes over 80 staff and volunteers to run, with months of set up. FHI has benefited from consistent management of the last few years, committed sponsors and a plethora of furiously dedicated, long-term volunteers. FHI’s achilles heel is, and has always been, Mother Nature. She is not as cooperative as the sponsors and volunteers. In fact, Mother Nature is more like the proverbial mother-in-law who comes crashing into the house, disrupting everyone’s hard work and peace of mind. While we could, frankly, summarize our review of this year’s Fair Hill with “it rained,” it does not seem fair to the efforts of all of those people to do that. So, while Mother Nature may have treated them cruely, we will endeavor to do better by FHI by giving the event a proper review. A tip of the rain hat to the Fair Hill staff, who did a fabulous job keeping the horses and riders safe and helping spectators in and out of the show grounds. With that said, the actual number of spectators was way down from prior years. The total attendance was approximately 10,000 people, with Saturday bringing in the largest crowds. However, when driving past the general parking Saturday morning (cross-country day) at around 7:30 a.m. (just 30 minutes from the start of cross-country), there were only four cars parked. Last year, there were at least 50 cars that early and by mid-morning the lot was almost full. The rain caused at least an hour delay to the start of cross-country, but even by mid-day, the parking area was fairly empty. Sponsorships were down about 20% this year, but that was expected given the economy. Colgan said that they factored in the recession when planning this year’s event budget. The amount of money raised for the Union Hospital of Cecil County was not available as of press time. Once again, the VIP tent was beautifully decorated, as were the arenas and cross-country jumps. Fresh flowers and greenery could be seen everywhere and brought some much needed cheer to the dreary weather. Judy Thayer’s fence decorating crew outdid themselves this year, decorating the Tiki Hut, which was unfortunately one of the jumps removed from the course because of the weather. It seems the decorations were bigger and grander than the jump itself. The new ducks were painted by Fran Loftus and found a home in the last water complex. Although a lot of thought was given to the Kids’ Corner and Mike Dupuy was back with his falconry demonstration, there were just no kids around to watch or play in the soggy hay maze. Once again, announcer Brian O’Connor did a great job all week explaining each phase to the small crowds, keeping everyone updated with rider scratches and changes to the courses. Did anyone else notice the lack of people movers on cross-country day? Was this due to the lack of people to move or the soggy ground? Colgan says both, “plus the tractors were busy working on the course,” and pulling cars and trucks into and out of parking areas. Kudos to those tractor drivers by the way! Many vendors complained that sales were greatly down, but understood that it is hard to make a sale if there is no one to sell to. However, specific vendors selling goods such as hats, gloves and boots had stock flying out of their tents. In fact, by mid-morning on cross-country day, Nantu Tamia Creations and Native, both selling hand knitted hats, gloves and scarves, were sold out of gloves. The DuBarry of Ireland crew only need to walk around the show grounds to generate sales of their high end rain boots instead of standing in their buckets of water. Did you buy any FHI logo-wear? Probably not if you didn’t know where they were set up this year. Instead of having their own tent right at the entrance, they were tucked inside the main tent with just a few things scattered on a table. Many shoppers walked right by without even noticing. In more recent years, if you didn’t buy what you wanted during the week, by cross-country day most of the gear was sold out. The food vendor area continues to offer a variety of food and drinks. Due to the weather, most people hung out in the large lunch tent in the middle of the course on Saturday, boosting sales for those vendors but dropping those of the two Pub tents. Although many at The Equiery still are not fans of the smaller program size, spectators love the format, now in its second year. It is easy to shove in a pocket or bag and pull out as needed. 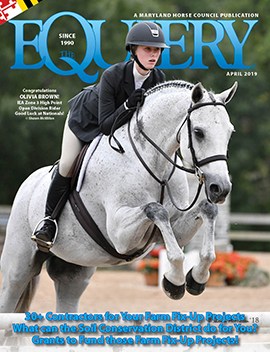 The interior pages are chock full of information on everything from dressage tests to dog agility and even had a page devoted to the Elk Creek Combined Driving Event, the only driving event still held at Fair Hill. We are happy to report that after we complained last year that her artwork was not given enough room to shine, Fran Loftus’s spectacular drawings and diagrams of the cross-country jumps were larger, making it easier for readers to understand and appreciate. Thank you! Did you get a chance to watch the Young Event Horse competition? Did you even know it was going on? For the first time, FHI hosted the Spalding Labs Young Event Horse East Coast Championships and, sadly, very few people even knew about it and even less came to watch. The addition of the YEH competition was scheduled early enough for the FHI marketing crew to really promote it, but for some reason they didn’t. We strongly encourage them to do so in the future! Fitting this competition into the already full schedule was a challenge for the FHI staff, which also had to deal with the fact that many of the CCI competitors were also riding YEH horses. However, how do you expect to have people watch if they don’t know where to go to watch or when it starts? Initially, the whole competition was planned for Thursday but then the schedule changed so that dressage was held on Thursday and the jumping phase was held in the wee hours of the morning on Friday. “Where?” you might ask. The competition was over at the Saw Mill, which is across the road from the main arena and is used for the horse trials, from Elementary through Intermediate levels. The Saw Mill location is great for the competition since it allows freedom for the course designers to use elements such as water complexes and ditches as well as portable cross-country jumps and show jumps. All of which need to be at a much smaller scale then the CCI courses. One might wonder however, if there is any location on the CCI course where a small YEH course could be made. Maybe have the jumping phase scheduled during the break between the CCI** and CCI*** cross-country phases and an awards presentation on Sunday? The organizers did redeem themselves with having the awards presentation done in the main arena during a break in the CCI dressage action on Friday. However, it was clear to those watching that nothing was really planned very well and even the announcer was not quite sure what to talk about. The 4-Year-Old presentation was a bit of a chaotic mess with horses either being led or ridden around while the judges talked about what they liked and didn’t like about each horse. However, no one knew which horse they were talking about since they were all moving as a group. The 5-Year-Old presentation went much more smoothly. Each horse was ridden around one at a time while comments were made, which made for a much better format to showcase these young horses. It would have been nice if there were a way for spectators to talk with the breeders and owners after the event. 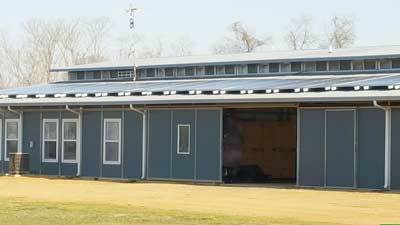 Maybe a separate stabling tent where the horses can be shown off? Where spectators and potential buyers could see them up close and personal? We do hope that FHI continues to feature the YEH Championships, but would like to see them expand on what could be a great addition to the FHI Festival in the Country. It was clear that organizers were somewhat winging it, organizing the YEH segment on the fly, but we feel certain that they will be able to put the experience to good use for future years, and could make the championships a little gem in their crown of stellar activities. FHI would like to host the YEH Championships again, but that decision is ultimately up to the — USEA. October 20-25, 2009 • Verizon Center, Washington, D.C.
Washington certainly had [a] kind of backstage chaos this year, bringing in entirely new management mere months before “opening night…and while there was sometimes confusion and scrambling backstage, the show on stage moved briskly along with nary a bobble. However, because the show is local, like most things local, local folks were acutely aware of the dramatic staff changes, and curious to see whether the new team could pull it off in such a short time frame. They did. Corporations, particularly not-for-profit corporations organizing major entertainment events, are dynamic structures, with the ever evolving boards of directors that is absolutely essential to keeping shows fresh and interesting. The entertainment event will unfailingly reflect the vision of the directors, as they hire the management team to run the event. If an event seems stale and boring, look at the Board. Have they gotten into a rut, in which the effort to keep up the routine trumps the effort to be creative? Look to a Board to determine if the interests are long term or short term. Is the Board dedicated to a long range vision that will grow the show, or immediately feathering their personal resume for community and volunteer work? Only time will tell whether or not this leadership’s long range vision will be successful. For those seeking immediate gratification, they were disappointed by this year’s show – and leadership. But for those interested in the future of the show, this year’s WIHS was fascinating to watch – and it seemed to those of us at The Equiery that the current leadership took a restrained approach to this year’s production while simultaneously laying a methodical foundation for the future. The current leadership oozes “creds.” Juliet Reid was instrumental in developing the WIHS’ powerful partnership with Autism Speaks in 2007 & 2008, which yielded nearly $385,000 for autism research, propelling her into her new role as president. “WIHS is vital to the equestrian industry and is a proving ground for young riders, who will form our future Olympic, Pan American and world championship teams. I would like to see it reach its full potential.” Juliet understands that in order for the show to reach its full potential, it must be a compelling entertainment event that can financially support itself. A Washington, D.C. resident, Juliet oversaw the relocation of the show offices from Gaithersburg to Georgetown, a subtle but critical puzzle piece in recasting the show as a essential part of the Washington entertainment scene and charity circuit. Also new to this year’s board are international jumper rider Georgina Bloomberg, of New York, N.Y., and local rider Victoria Lowell, of Brookeville. Vickie is Senior Vice President of Marketing for Animal Planet Media, where she helped consult on production of the Animal Planet equestrian programming—HorsePower: Road to the Maclay, the Animal Planet Sporthorse Cup and the World Sporthorse Championships series. Lowell is a lifelong equestrian and rides as an amateur in the jumper divisions. WIHS’s relationship with Animal Planet played a subtle difference in this year’s show, sure to increase in future years. Chief Operating Officer Tony Hitchcock has been the executive director of the Hampton Classic for 28 years, and has served as senior vice president of HITS (Horse Shows in the Sun) since 1999. Chief Executive Officer Eric Straus, who came on board in August, is a former executive director of the American Horse Shows Association (now the U.S. Equestrian Federation). The fresh blood brought fresh sponsorship, including The Boeing Company, Honeywell International Inc., Animal Planet, Chevron Corporation and Comcast, helping the show hit the $1 million for cash and contributions, and increasing its cash sponsorships by $200,000 over 2008, not only a gratifying accomplishment for a new team, but accomplished during a recession! Kudos! While the new leadership certainly has a vision for the show’s potential, they did not put it through a radical makeover this year. Instead of souping up a car they had never driven, they spent this year learning how to drive the car as is while they figured out the engine, and tweaking a little bit here and there this year, but saving any dramatic changes for the future. So, while our readers may not have seen a lot of dramatic differences, if we look closely, we can see evidence for a new foundation. As we have stated ad infinitum, WIHS has to find ways to “get butts in seats,” to encourage spectators of all types and inclinations. WIHS pays a hefty fee to rent the Verizon Center, and Sunday has traditionally been a revenue black hole: while rent is paid for the entire day, the Sunday morning hunter classes attracted a negligible number of spectators. Vendors tended to pack up on Saturday night or early Sunday morning, and by afternoon the Concourse was a ghost town…yet the show was still paying rent on the facility. Enter the brainstorm for ‘World of the Horse.” An 11th hour idea, the concept was to take advantage of the fact that they had a paid-for arena by rolling up all the already-paid for demonstration acts into one competition-free equine entertainment show. Organizers’ target audience was parents anxious to find something affordable to do on a Sunday afternoon with their children. For this year, WIHS augmented the demonstrations with local horsemen showcasing exotic breeds or flashy sports. Comcast sponsored free tickets for all children 12 and under, while regular ticket prices were a family friendly at $15 per person. The Equiery sponsored a program designed specifically for the “World of the Horse,” with an eye towards converting all those non-riding spectators into riders. The Equiery program provided information on how to evaluate lesson programs, as well as our usual free directories (only in a larger font size than usual!). Was World of the Horse successful? Well, not if you were to listen to some of the feedback from the horse people that were present. However, we at The Equiery feel that, given that this was an 11th hour idea with no time to roll out a real marketing campaign, World of the Horse made a successful, if modest, debut, and we have no doubt that World of the Horse can be expanded into an exciting component of the weekend. The ticket sales for Sunday were encouraging: over 1,500 tickets were sold, five times more than the 300 sold last year for Sunday. And since kids were free, the total number of spectators for Sunday afternoon easily reached close to 3,000. With a full year to plan and market a true equine entertainment extravaganza, vendors would be wise to take note and plan to stay through Sunday afternoon. Organizers would be wise to keep one simple word of advice, overheard by an Equiery staffer: “needs more Disney.” Now that organizers have a full year to plan, we have no doubt that they will, indeed, infuse “World of the Horse” with “more Disney,” more top-notch professional equine entertainment. Even the cynical, hard-to-impress horse people will show up in droves for top-notch professional acts. Once the concept for Washington’s World of the Horse was launched(remember, at the last minute), both WIHS and The Equiery agreed to backburner “Barn Night,” throwing limited resources instead into launching the World of the Horse, hoping to retool Barn Night for the future. We were surprised, and even gratified, to discover that Barn Night was sorely missed. Thank you for letting us know that, and we promise to work with WIHS to find some way to do something with the local barns next year. Although there was some talk about making Sunday afternoon “Barn Day,” we are fully aware that that is not an option for most of the local barns, as local riders have their own local shows and events on Sunday afternoon. We also know that you go to “Barn Night” to see top jumpers, not demonstrations. We will keep all of that in mind as we work with WIHS organizers for next year. In a brilliant strategic move, WIHS christened its first Honorary Youth Chairman. The job of the Honorary Youth Chairman (with the help and support of the show staff) is to reach out to local schools and youth programs, to help WIHS build stronger relationships in those communities, with an eye to increase the involvement of the local community in the show itself. Remember, other than the periphery programs, the new leadership did not change too much off the core program this year, but they tinkered, and in their tinkering one can see glimpses of what the future brings. While the ramp-up to the show may not have been as strong as in prior years (and often is a reflection of budget), the coverage once the show opened was outstanding, with articles and photos in some section of the Washington Post almost every day of the show. Perhaps this was the result of Diana de Rosa’s outstanding media kit, which spoon-fed story ideas to the general media, many of which popped up in the Post and other local dailies. Or perhaps this was a result of the efforts of this year’s 19 member Public Relations Committee; the committee was dedicated just to public relations and consisted of some paid staff, some contracted staff, some board members and some volunteers. No doubt they will be able to ramp up pre-event marketing for 2010. In prior years, classy artwork has made the official posters, scarves and other keepsakes collectors’ items. Despite the fame of this year’s artist (as an illustrator of children’s books), our readers found the child-like art poster and program cover inappropriate for a prestigious show. Perhaps organizers sensed this might be the case, because they were savvy enough to print overruns of the marketing poster (that herd of white horses galloping through the Reflecting Pool), which were snapped up by showgoers. Undoubtedly, we will see more 2009 marketing posters displayed in barns and tack rooms than we will the official poster. And George got a makeover! WIHS’s venerable old logo of George Washington astride a horse got a fresh new design, making him much easier to reproduce in embroidery for WIHS logo wear. The website likewise received some functional renovations. Last year, in these pages, The Equiery asked organizers to post all the press releases on the website and make them easy to find, and they did! WIHS joined the social media age, with Facebook and Twitters, immensely pleasing the younger equestrian set. However, WIHS did get dinged on one standard piece of marketing that was absent this year, and in the process, The Equiery got dinged as well: of all the WIHS ads in the September and October issues, none of them featured the basic schedule of the high profile classes, the classes that our readers want to see. Yes, they told us, they can find it on the web, but they want it in The Equiery as well, so when they are in the tack store or in the barn, they can easily and quickly find the major class schedule. We hear you, and we promise to work with WIHS next year to ensure that that one of their Equiery ads features this standard information. From the top down, the WIHS staff bent over backwards to work with and be accommodating to the media and their local supporters. We recall, in our gossamer coated memories, a Washington in which every night was an “occasion,” with a party of some, often glittering, black tie affairs, some held at the arena other times held in some fabulous place, such as an embassy. In the grind that became the routine of Washington, these social functions gradually eroded, leaving a ho-hum exhibitors party and an often anemic Saturday night party for sponsors and spectators. The new leadership is attempting to infuse that sense of occasion into the week, setting up social activities in and around the Verizon Center and promoting them not only to competitors but also to fans. Page 17 of the program listed the variety of social functions, including a party for amateur horsemen at Clydes on Tuesday night, a party at the trendy restaurant Zaytinya, and an after-party at the Red Roof Inn. In addition to making Washington fun again, these events also help to build relationships with the local business community…laying those foundation blocks for the future! In a move that startled the city’s leadership, Juliet Reid and crew visited them to ask them what WIHS can do for the city! City leaders were accustomed to being asked for favors and to dispense help, so being offered a hand was something new. WIHS leaders presented economic impact data to city leadership, illustrating the multi-million dollar affect the show has on the city’s economy, and asked how they could strengthen that relationship. Equestrians are infamous for loathing cities, entering the city under duress, keeping heads down, eyes on feet (or the headlights in front of them), as they bolt in and out of the city. WIHS organizers aim to change that, to make the city of Washington an attractive part of the mystique of the show, thereby strengthening the show’s relationship with the city, and ultimately with sponsors. A “Passport to D.C.” was designed specifically for riders, filled with tourism tips and coupons to local restaurants and stores. Riders, and even some vendors, talked about taking the time this year to really discover D.C.
WIHS organizers should be able to build on this, making the show and the city itself a destination for equestrian spectators, for encouraging equestrians to stay in the city, to enjoy both the show and the sites – or at the very least convert the dreaded Metro ride into an adventure for local equestrians! For years, our readers have complained about the ticket prices, and this year management figured out a way to reduce the prices (thanks to help from their sponsors). Adult regular admission ranged from $15 to $30. Students, military, Metro cardholders, groups and Comcast employees could all take advantage of an additional $5 discount. “We wanted to make the show accessible to more people, especially with the economy the way it is,” said Chief Operating Officer Tony Hitchcock. Organizers also considered the recession-based concerns of the competitors. Previously, riders could only qualify for Saturday night’s $100,000 President’s Cup Grand Prix in preliminary classes at the show. Hitchcock said that this year some riders were concerned about investing in the trip. “They were reluctant to come not knowing if they’d be able to ride in the Grand Prix,” he said. So the show changed the qualification process, extending invitations to the top 25 riders in the United States Equestrian Federation ranking and the top five European riders. All in all, the equine demonstrations were received with lukewarm appreciation, except for dressage and a very special demonstration to honor the fallen soldier. Dressage enthusiasts were happy to see Canadian Olympic Team member Ashley Holzer’s musical freestyle exhibitions with her Dutch warmblood Pop Art during the evening performances. In 2008, eighth-generation circus performer Caroline Williams entertained with “Big and Little,” a black Fresian stallion and a matching mini. Horse people and non-horse people alike enjoyed her act. She returned this year with a “Chiffon Act,” in which she wore a white gown with flowing scarves as she guided a Paint using fabric reins. The act is pure theater, but not particularly impressive to an audience of horse people. In fact, the only ones who seemed to appreciate her act were the Miley Cirus crowd of little girls under the age of 8, who were enchanted that their two favorite things had been combined: a fairy princess in a chiffon dress and a horse. In addition to the traditional crowd-pleasing Jack Russell terrier races was Zak George of Animal Planet’s Saturday night television show “SuperFetch.” Zak and his hyperactive 6-year-old Border Collie Venus performed Frisbee tricks and other physical feats. On Saturday evening, The Caisson Platoon of Fort Myer, Virginia, also known as “The Old Guard,” presented to a hushed crowd a special exhibition in honor of the fallen soldier and the wounded warrior. Long time show announcer Oliver Kennedy noted that the only other time he had ever witnessed the crowd so stilled and reverent was when the paralyzed Christopher Reeve spoke, believing the caisson presentation to be one of the most emotionally moving moments ever at WIHS. The platoon participates in the military burial ceremonies at Arlington Cemetery, and also helps soldiers recovering from combat injuries at Walter Reed Hospital in Bethesda with a therapeutic riding program. Absolutely, Equiery readers would like to see the caisson presentation become a permanent part of the Washington International Horse Show. This year, WIHS partnered with many charities, providing those charities with promotional opportunities. These charities included Horses and Humans Research Foundation, Equestrian Aid Foundation, Autism Speaks, American Hippotherapy Association and Child Help. Only one charity will be the direct beneficiary of cash support. The Equestrian Aid Foundation will receive approximately the $25,000 raised from the annual silent auction plus the fundraiser held Tuesday night at Clyde’s. While the cause is certainly worthy, it is not a compelling, inspiring, D.C.-based charity which can be embraced by animal and non-animal people and the media. Why a “non-animal” related charity? Why not a local animal shelter or humane society? Because the general public already views equestrians as elites who care more about animals than we do people. While it may perhaps be true that we care more about animals than we do people, it does not help our public image! A fundraiser to raise money for ourselves (be it for injured equestrians or therapeutic riding) or for animals (such as rescue horses or dog and cat shelters) only augments the perception that we are out of touch with the real world. However, when we raise money for causes such as children with autism, research for cures for the disease du jour, or for institutions such as Children’s Hospital, then we are embracing something larger than our own world, and the world embraces us. We would dearly love to see WIHS establish a long term relationship with a high profile, emotionally compelling, non-animal related charity such as Children’s Hospital. We envision being able to take horses to visit the institution, and taking the hospital staff, children who are stable enough, and their families to see the show. We see the good will and media attention that can result from such a heart-warming relationship. Having said all of this, we would be remiss if we did not note that WIHS did something quite creative this year in raising $45,000 in sponsorship money to underwrite the cost of tickets, which were in turn were provided to military families gratis. Semper Fi! It takes a while to change the course of a massive cruise liner. A captain who attempts to do it too quickly will rock the boat in a way that can make the passengers seasick, fling the crew and cause the chairs, china and crystal to smash about. A good captain is able to turn his ship imperceptibly, without causing undue stress on the crew or passengers, and keeping everything in its place – but triumphantly charting a new course with a brighter horizon. We look forward to brighter skies for the good ship Washington.